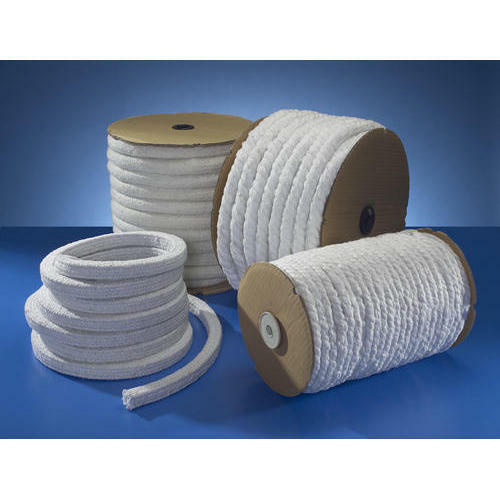 Our range of Ceramic Fiber Ropes is made from ceramic woven yarns reinforced with fiberglass yarn or stainless steel wire for high temperature resistant up to 1260°C. Ceramic Fiber Rope is widely used in thermal insulation industry where superior high-temperature strength and insulation properties are required. They form an excellent direct, asbestos free, substitute for the equivalent asbestos textile products. With experience in this domain, we have attained a resounding name in the sphere of wholesaling a wide range of Ceramic Fiber Blanket, Ceramic Fiber Board, Ceramic Fibers, Ceramic Fiber Textiles, Ceramic Fiber Paper, Insulation Bricks, Insulation Materials, Fire and Mullite Bricks, Polosint Insulation Bricks, Calcium Silicate Blocks, Bulk Fiber, Burner Block, Refractory Anchor, Insulation Material, Industrial Fire Welding Blankets, Insulation Brick Installation Services. Our experienced specialists make sure to keep in mind that these products are developed in accordance with the guidelines of quality standards and norms. We utilize high-grade raw material and advanced manufacturing methodologies to develop the entire range. The products offered by us are utilized for high-temperature insulation applications in different industries. Our range facilitates the clients to utilize energy effectively & efficiently and thereby, contributing towards checking global warming issues.We provide Insulation Brick Installation Services to our clients.